Capt. Sean M. Roughneen (l), Company A, 2-104th General Support Aviation Battalion, returned on Feb. 2 from a year-long deployment in Southwest Asia, says good-bye to his twin brother, Capt. 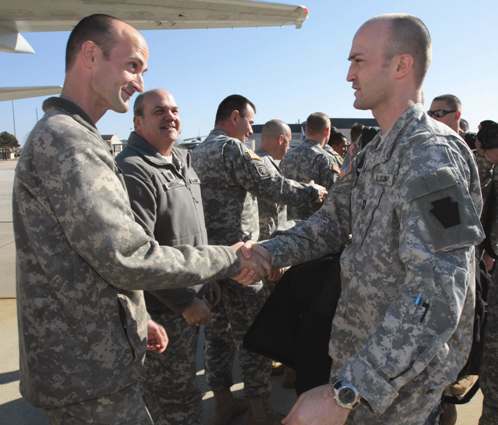 Joseph E. Roughneen (r), 1-150th Assault Helicopter Battalion, as his unit leaves New Jersey for pre-mobilization training before deploying to Iraq. Photo by Tech. Sgt. Mark Olsen, 177FW/PA.